This is the first time I’ve ever tried cooking this, so it attests to how fail proof and good this recipe is. 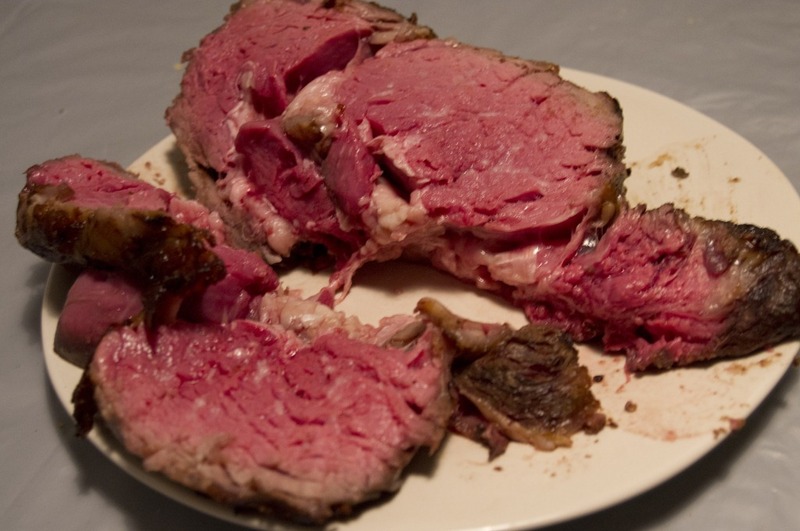 So you don’t have to worry about over cooking an expensive cut of meat, and you’ll have restaurant quality prime rib. For seasoning, its pretty much whatever you’d like to do. I opted for rubbing some balsamic vinegar all over the steak, just enough to moisten the outside, and packing on lots of coarse sea salt on the meat (not the fat parts). The original poster of this made an Herbs de Provence spiced butter, smeared that all over and then covered with salt. It all depends on your personal preference. it works best if with newer ovens, as older ovens may not tell you when your oven has reached the desired temperature as well as not being being able to retain the heat inside as long as modern ovens. turn off the oven and leave it for 2 hours. DON’T OPEN THE OVEN AT ALL COSTS! otherwise the heat that was generated from the roasting will escape and the roast will not finish cooking. remove, slice off the rib bones (I kept mine, the meat around the bone are the best in tenderness and flavor!) and serve onto a heated plate. a crunchy black crust had developed and the meat was tender and moist. arnie mortons at home anyone? credits to http://foodwishes.blogspot.com/ for the ingenious recipe. hi, I have a 2.5 lb roast, but it doesn’t have the bone… Can I still use this method? Thanks, I hope I hear back from you in time! i dont think it will work exactly with the formula. you may have to estimate it. i have never tried it on a boneless roast, sorry! THanks for the reply. I really have no idea what to estimate. I’ve never made one before. If it were you, what would you try? i would actually just calculate it according to the original formula. since the bones arent there, the initial weight calculation should be good. its mainly to sear the outside to create that crust, as the remaining two hours is the roasting process. ok, thats what I’ll try! I really appreciate it, I’ll comment tomorrow and let you know how it turned out. Merry Christmas! no problem, i hope it works out well for you! wanted to let you know, it turned out perfect following the regular formula. I was impressed with it. Thanks for the recipe and help! Hi – Did you let your roast sit before carving it? yes, tent with foil and let sit for about 10-15 minutes. it is best served on a heated plate as the roast will have cooled down a bit. also if you make an au jus sauce, this can be used for dipping it to warm it back up.